*Reminder: Please refer to the actual size before ordering, do not use imagination as a judge! :)* ◆ the number of sales for a single 1! Not a pair! ◆ For more than one, please first ask the letter asking inventory, let me help you adjust the number! Thank you ◆ recommended with the museum different brass earrings can also be a single number 2 is a pair :) ☞ ☞ ☞ Confirm Re-order! ☞ using__shell__, each having both**different unique textures**the difference in the color portion of the error generated according to the commodity. ☞__brass is easy to oxidize the material, the color will become darker. __ ► Material: brass, white butterfly ► Size Reference: Shell 3.5 * 25mm Q1: Is it possible to make a clip? can! 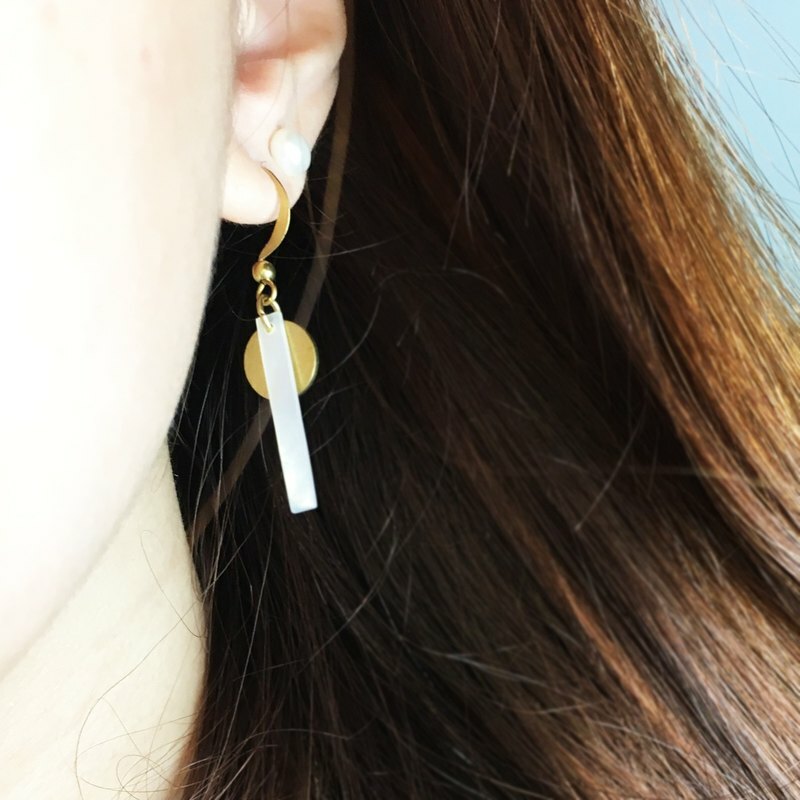 The store brass series can be directly changed folder type, because the brass ear ear with the ear clip cost is similar, no need to make up the difference, there are goods can be directly under the single. Q2: What are the two types of material? (1. Non-plated brass 2. Copper-plated gold) Ear can be used with the overall non-electroplated brass material, the other also provides copper-plated gold plated ear, according to individual needs to buy. Brass ear can be used together with the earrings to maintain care, gold-plated ear-color retention for a long time, but the subsequent plating spalling is difficult to return, can be included in the assessment, if other materials, custom demand, welcome letter asked. ▲ Note ▲ Because the goods for the handmade, so every work may have a little bit of a small gap! Do not mind if you do not mind. Photos will be different from the screen and the shooting light will be slightly different color, please consider clearly accept the purchase. ◙ brass material description and maintenance ◙ For brass Note: pure brass for the non-electroplating material, easy to oxidation, will make the color bleak, darker, spots are normal phenomenon, into a more retro nostalgic, low-key introverted style. · To delay the oxidation rate, refer to the following: ► rust: Vaseline (thin coating, can achieve a little isolation of the air effect) ► Polished rust: toothpaste, lemon juice, silver cloth, copper oil (can be used to wipe the brass, then dry with a soft cloth.) ► use habits: try to avoid contact with sweat, perfume, touch the water as far as possible after dry to keep dry, usually no wear can be closed in the sealed bag. ◙ copper plated gold ear needle instructions ◙ This is the electroplating material, wearing a long time after the fade, peeling a little problem, although compared to pure brass, gold-plated ear color retention for a long time, but after the oxidation can not return the source shiny. Can consider their own discretion Oh! [MORI DORI intimate service] Each piece of goods before we will carefully packaging, so that you give gifts from the two affordable:)))) Outer packaging for the kraft paper box, due to order quantity, size is different.